The Swedish Accident Investigation Authority SHK recommends Swedish and Estonian authorities to conduct an audit of an Estonian airline that failed to report an abnormal landing incident. The airplane involved in the abnormal landing incident was a BAe Jetstream 31, ES-PJB, of AS Avies. On February 13, 2013, the airplane operated on a scheduled passenger flight, AIA 2094, from Luleå/Kallax Airport, Sweden, to Pajala Airport. There were 13 passengers and two pilots on board. The commander was Pilot Flying. Upon landing at Pajala the airplane touched down with the nose wheel and right main wheel outside of the asphalt edge of the runway. 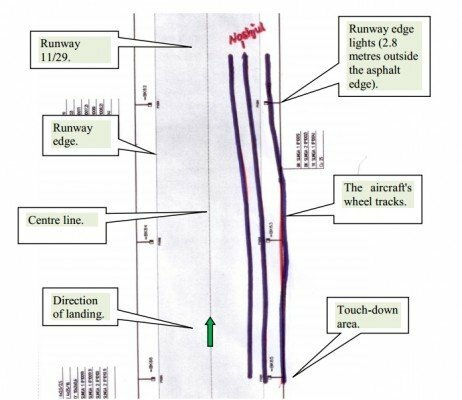 After rolling approximately 200 meters partly outside the runway the aircraft was steered up onto the runway. No runway edge lights were damaged and no damages were reported to the aircraft. The runway was covered with snow and approach and runway lights were illuminated to a maximum of 10%. The weather was overcast with low cloud base and reduced visibility in snow showers. The wind was light with drifting snow over the runway. After the incident the commander undertook an external inspection of the aircraft without finding any damages. According to the Maintenance Manual of the aircraft, a technical inspection shall be carried out by a type certified technician after occurrences with hard or abnormal landings. No such inspection was performed and the aircraft was dispatched for traffic the following morning with another crew. The commander called Avies Flight Operations and reported about the incident but no written report was sent to the relevant authorities. The airport reported the occurrence to the Swedish CAA 50 days after the incident. Based on the safety deficiencies identified with respect to the operator in this investigation, as well as deficiencies identified in another investigation concerning the same operator, SHK has made a decision to call attention to these deficiencies by means of an official letter addressed to the Estonian and Swedish regulatory authorities for civil aviation. The letter contained a safety recommendation to both regulatory authorities to – separately or jointly – carry out a full operational and technical audit of the operator. The incident was caused by deficient directional control during the final stage of the landing, probably with perceptual illusions from drifting snow and dazzling by high-intensity lights as contributing causes.